Marvel’s now-classic Spider-Man adversary Venom has been on a strange journey of discovery over the last decade or so. 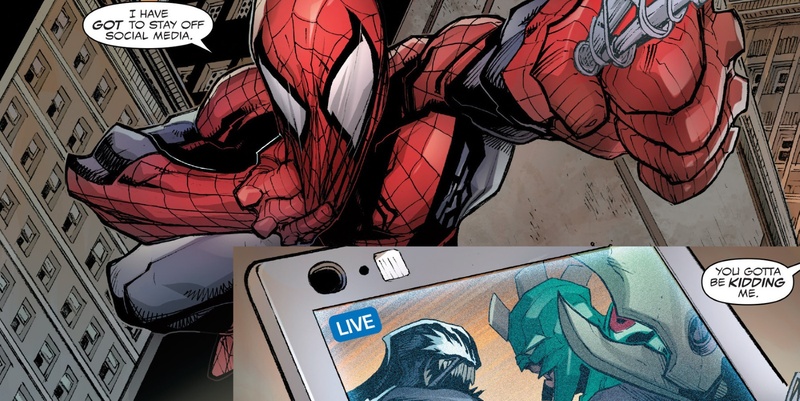 Once, the symbiotic suit was a fairly one-note nemesis, channeling Eddie Brock's hatred for Peter Parker – who he blamed for his dismissal his Daily Globe investigative journalist gig – into a spider-hunting machine. As time went by, Venom and its host developed a more complex relationship, as the super-suit being able to feed off Brock’s desires to reform and vice-versa. Eventually, Eddie made the choice to deal with his rage and pain rather than channeling it, and the symbiotic entity moved on to its next host, Mac Gargan – before later teaming up with Flash Thompson and becoming a true interstellar hero. Speaking of Mac Gargan, Venom #5 brings new dangers for Venom’s new host Lee Price, as the dangerous Scorpion is now an enforcer for the Black Cat Gang. Initially suspicious about Price and his involvement, Mac uncovers the mercenary’s symbiotic secrets. Their internal power struggle quickly takes a turn for the external, as Venom and Scorpion’s private fight goes viral, where Spider-Man catches wind of it. Spider-Man, like many in the superhero community, was of the opinion that Flash Thompson and the symbiote were still one and the same. So, when he catches a video of Venom battling the Scorpion, as New York’s friendly neighborhood hero, he swings on by to assist. Naturally, he's rather perplexed to find out Flash is trying to kill Gargan. Caught in the crossfire, Spidey manages to save Mac and several others, but before he has a chance to confront Venom on his actions – or discover who’s really beneath the skin – Price and the symbiote flee. But it’s already too late, though; Spider-Man may not know who's inside but all the wrong people do. Of all the secrets exposed in Venom #5, some of the most interesting involve a smattering of images revealing a little more about Lee Price. Locked inside the mercenary’s head, the Klyntar warrior begins to unlock some of his darker aspects, which finally paint a broader picture of who Price was before his hard-edged mercenary days. And it’s about time. Thus far, the Venom symbiote has been, without a doubt, the most compelling character from the soft reboot. Otherwise, Price seems somewhat generic (albeit clever and ruthless) and generally disagreeable. The brutal childhood and war-story horrors teased in the first issue are now bubbling to the surface, allowing fans better identify with former Army Ranger. As things go from bad to worse, though, it’s going to take his ruthless tactics to keep both of them alive, though. Seeking some leverage, Price figures out where Black Cat’s right-hand man, Adams, lives. Since Venom and Scorpion’s battle was launched into the public arena, he figures Ms. Hardy won’t be too pleased that her underling went over her head, especially after botching the job. Armed with his information, he scares Adams into a meet-up with his FBI informant. Things are finally looking up for the new duo, as Black Cat’s numero one is about spill the beans on the whole operation. However, it turns out the G-Man is on Black Cat’s payroll too. Adams and Agent Bagman turn the tables on Venom, shooting it with incendiary rounds. Fortunately, Price’s cooler head prevails, and they knock over a water tower, dousing the fire. As the deluge of water threatens to push everyone off the roof, Venom leaps onto the FBI’s awaiting helicopter and escapes... for now. It’s bad enough to have an FBI agent taking a meeting without giving much of a heads up; it’s still worse to watch an FBI chopper go down in flames after a giant toothy menace hops onto it. The Feds are none-too-pleased with current developments in the Price-Venom case, and the chief inquires about the status of their anti-symbiote team. Unfortunately, it seems the team pretty much disassembled – except for one man, Eddie Brock. Brock may be an army of one at the moment, but he isn't one to be trifled with, either. As Venom's second host, he certainly knows his way around symbiotes. Despite occasionally being pulled back into the Venom game, he’s managed to shed much of the negativity that fueled his early days and has tried to make a positive contribution to society, especially when bonded to his most recent symbiote, Toxin (one of the spawns of Carnage). His unique partnership made him an ideal addition to the Symbiote Task Force, who sought to chase down Carnage and stop him from ending of the world, in essence. Sadly, much of the squad was either killed in action or scattered to the winds after the recent brutal battle. As “Venom Madness” continues into April, in preparation for the 150th issue, writer Mike Costa is really turning up the heat on Venom (never enjoyed by the Klyntar people) and Price. Although the next issue's promo may be nothing more than a tease, it suggest a proper Eddie Brock-Venom reunion: It's possible, although unlikely, that Eddie will take over for Lee Price going forward, completely spinning the series on its head. What seems more likely, though, is Brock stopping by to run interference in the new Venom’s life. Either way, we’re looking forward to finding out, when Venom #150 arrives in May. Venom #5 is currently available. Venom #150 hit stores tentatively on May 24, 2017.